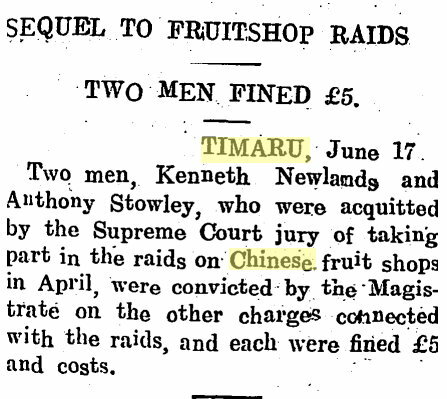 Timaru is a thriving small town in New Zealand, by the early 1900`s my Grandparents Albert Andreassend and Hannah Bertha had settled there. 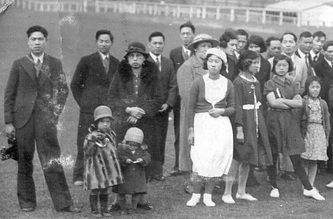 In 1916 Hannah`s daughter Hannah Christina married Charlie Lum also known as Ngh Gin Lum or Ng Moon Gain, they lived at Saltwater Creek with their family. 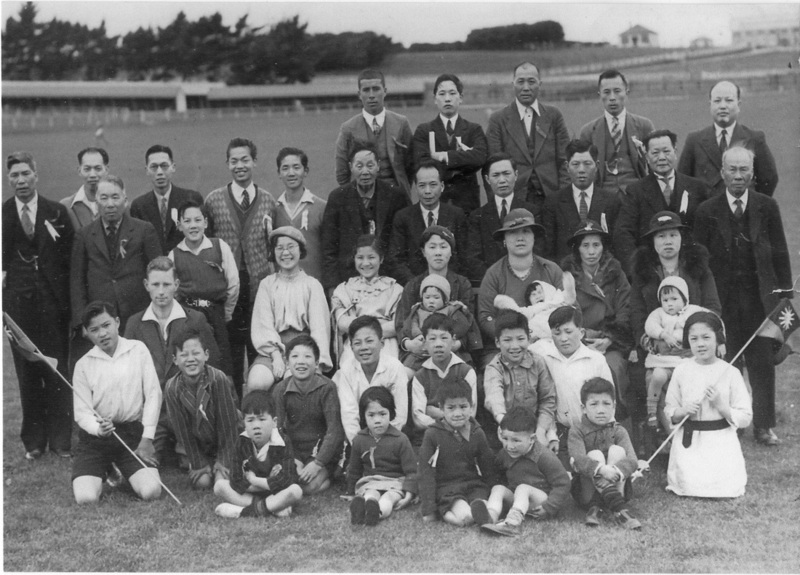 Charlie along with his one or two brothers owned Sue Lee Gardens in the early 1920`s it was possibly the most prosperous market garden in the South Island. 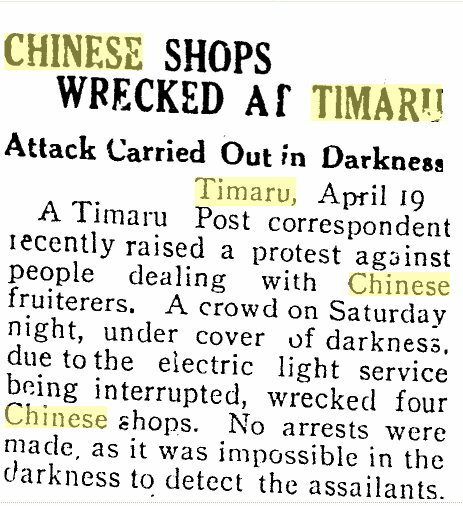 Information about the Chinese in Timaru has been scarce, apart from newspaper cuttings and some photos from the Lum descendants nothing further, I didn`t even know there was a vibrant community let alone any photos recording events. 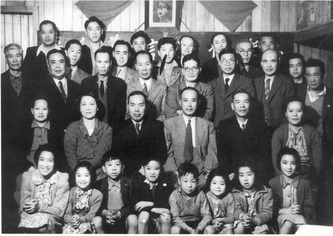 Incidentally Charlie Lum`s brother Ng Moon Jem was baptised by Rev. R. Jackson in Chalmers Presbyterian Church, Timaru c.1903. 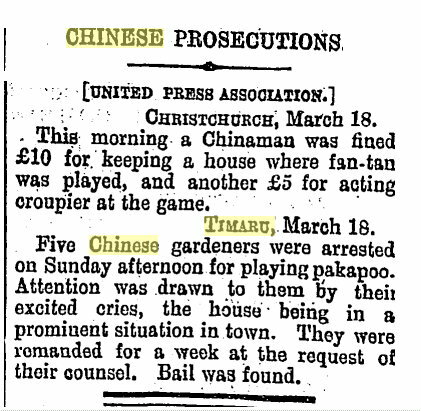 I know it was difficult to be Chinese in New Zealand, being in a small town so much harder, apart from the politics and laws, there was no escaping being Chinese in everyday Timaru society. Unfortunately there was alot of negative press, but it does add a sense of what it would have been like to live in those times. 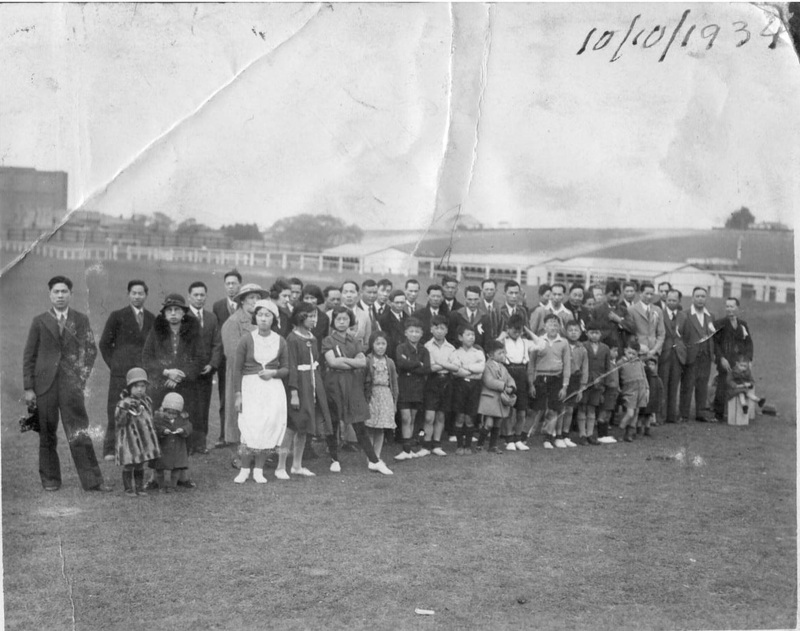 Do you have any photos, objects or memories about the Chinese in Timaru? It is a largely forgotten part of Timaru History and now is the time to collate and rediscover their part in Timaru history. Discussions are now taking place now to see what form it should take please call for more information. (From "N.Z. 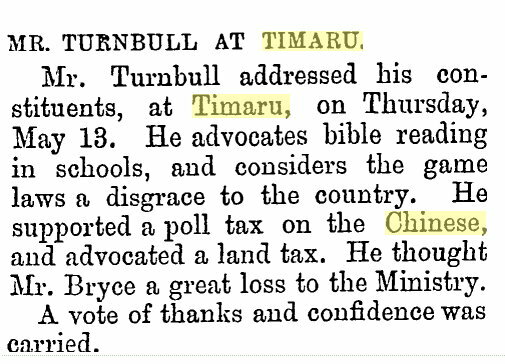 Truth's" Timaru "Representative. 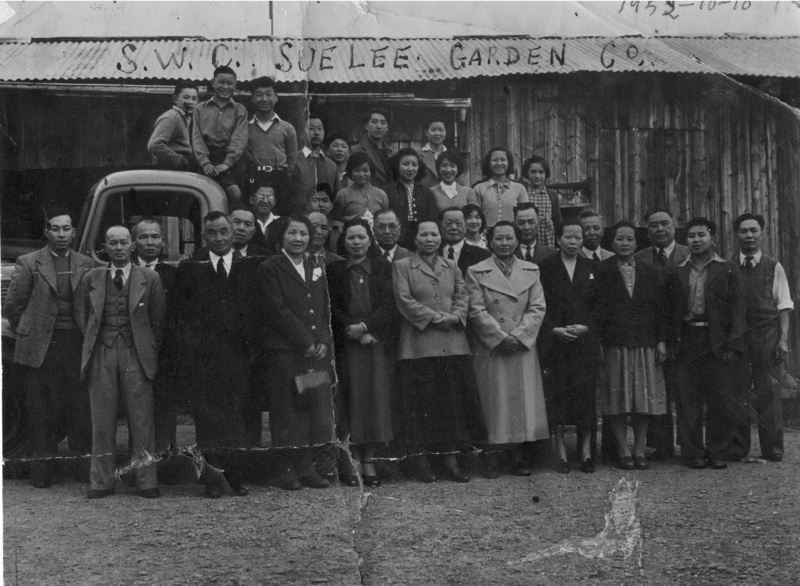 Offering nothing more to the public eye than the unpretentious front of a Chinese eating house, there was little about the premises of Wah Lee at 43a Stafford Street, Timaru, to attract the attention of the hundreds of residents who passed it daily. 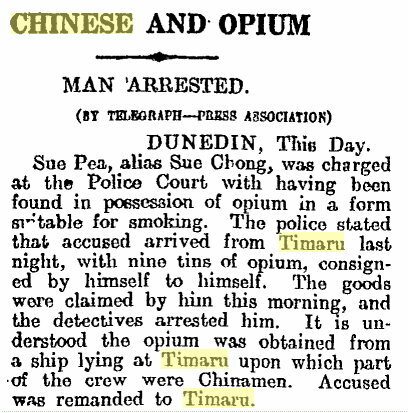 Little did the public believe that it was the olosely guarded sanctum of Chinese opium smokers. The ever watchful eye, of the law, however, had not failed to notice the signs of irregularity about the premises. For some time the police had suspected that all was not as it should have been within those humble-looking walls. ON a recent night a watch was set by Constables W. Devine and A. A. .Herron, who had adopted civilian clothing, for the purpose. At intervals Chinese were seen entering and leaving the building. Each new-comer, 1 as he stopped outside the front door of the premises, was observed to knock and exchange a password with an attendant, who, before allowing him to enter, took the precaution of first viewing him through an aperture. The constables bided their time, awaiting a favorable opportunity of making, an entry. For all the cunning of the Celestials to guard .the secrets of their nefarious sanctum^ the entry was made rather easily. 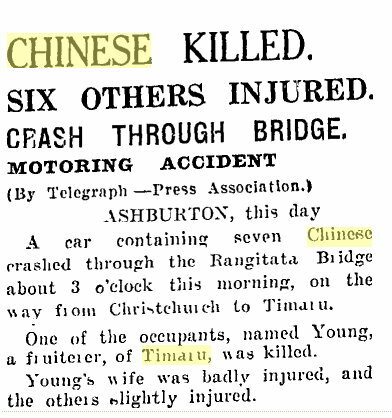 Towards 'midnight a Chinese was observed by the constables (who were hiding m a shadow) making m the direction of the door where others' of his race had passed m; Pretending drunkenness, the constables were right on the heels of the latest. arrival (to. the den, when he came abreast of the door. The visitor and door attendant exchanged greetings through 'the aperture and the door swung quietly open. No notice was tuken of the two rowdies apparently arguing over a bottle, a few feet away; The Chinese failed to notice that the "bottle" was a policeman's electric torch. Dropping the guiae of drunkenness at the right moment, the police were In possession of the doorway m a flash. At this stage the arrival of Constable J. Devlan m uniform Btrenthehed the forces of the law. The three pushed their way inside before the door I could be shut, bar- ring the way j into the den. Con-t- i stable- Devine, who was at the head of the pol ic c •party, and Constable Herron, were assailed by two. attendants who had been standing guard inside the door. 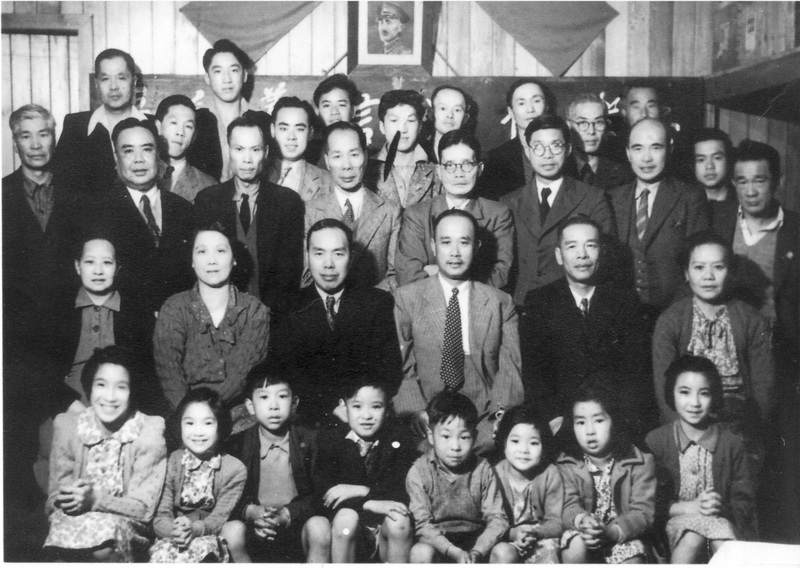 There was a brief scuffle, but it soon subsided when the Chinese realized that they had met their match m the unexpected guests., The police were now m possession of a passage-way giving access to three rooms which comprised the building. 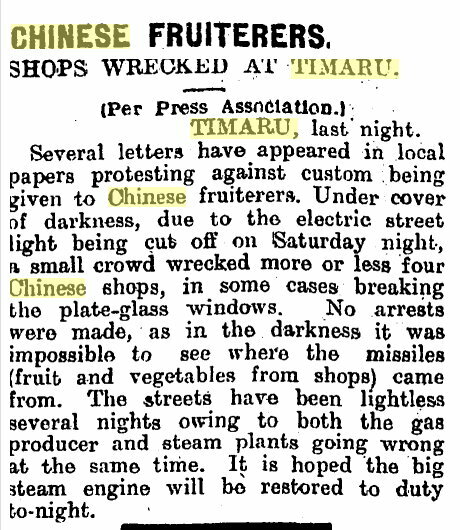 Immediately, opium fumes were detected. The unmistakable odor of the drug hung heavily m the atmosphere. A dull light was showing through an open doorway on the left a few 'feet down the passage. This door led into a poorly furnished room where Devine found a Chinese smoking opium. Lying half-clothed on a bed, the man was already half dazed, from the affeots of the drug.' Beside him was a complete opium smoker's kit. His dream, whatever it was, was rudely interrupted" by a hand which came out of the gloom and plucked the pipe from his lips as he was about to draw a breath of the fumes into his lungs. He sat up and drowsily looked about him, but was able to take very little notice of what was going on. The man was arrested and his equipment confiscated, along with a small phial containing a quantity, of opium. Searching the room, Constable Devine found a slot under the floor, m one of the corners. In this was hidden a two-ounce tobacco tin almost full of "seconds"^ the name by which opium, that hasbeen once used, is known. This also was confiscated.- Further down- the passage, m a second room, which was also poorly For tricks- that are vain And ways that are dark The Heathen Chinese is peculiar. —Bret Harte^ furnished, and badly lighted, the police surprised rive more Chinese, seated around a low table engaged at- tentively upon a game of Mah Jong. 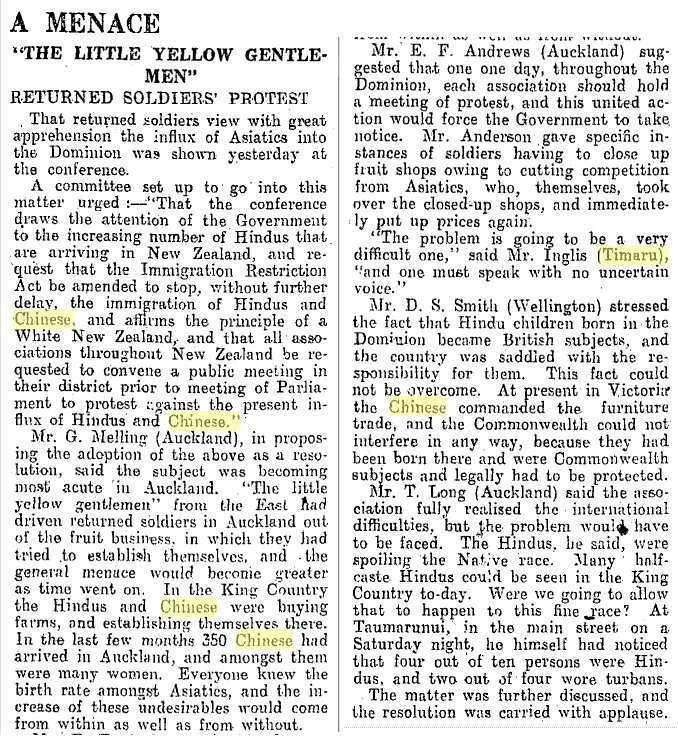 At sight of the police, the yellow men were greatly agitated. They made no resistance, but cowered m the farthest corner of the room, talking excitedly m highly-pitched voices. 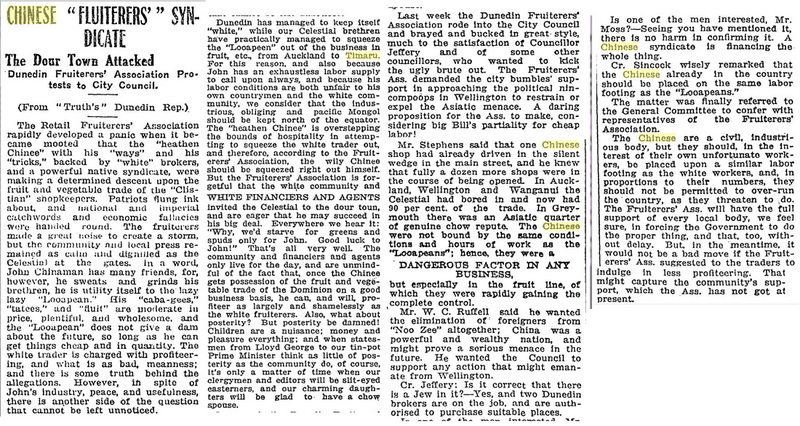 Eight Chinamen were lined up and marched to the Police Station where Ah Yee was arrested on a charge of smoking prepared opium, while Wah Lee was arrested on a charge that, as occupier of the pre mises, he 1 had allowed them to be used for the smoking of opium. 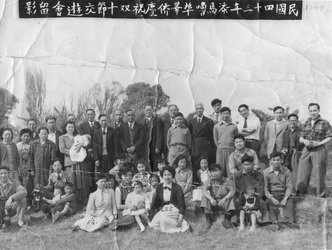 The remainder of the Chinese were released. 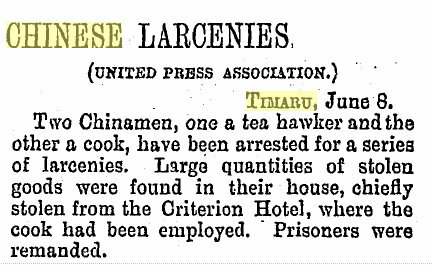 The two, arrested Chinese offered a very crestfallen appearance when they appeared before Mr. C. R. Orr- Walker, S.M. They had the assistance of Lawyer W. H. Walton. Ah Yee was dealt with first. 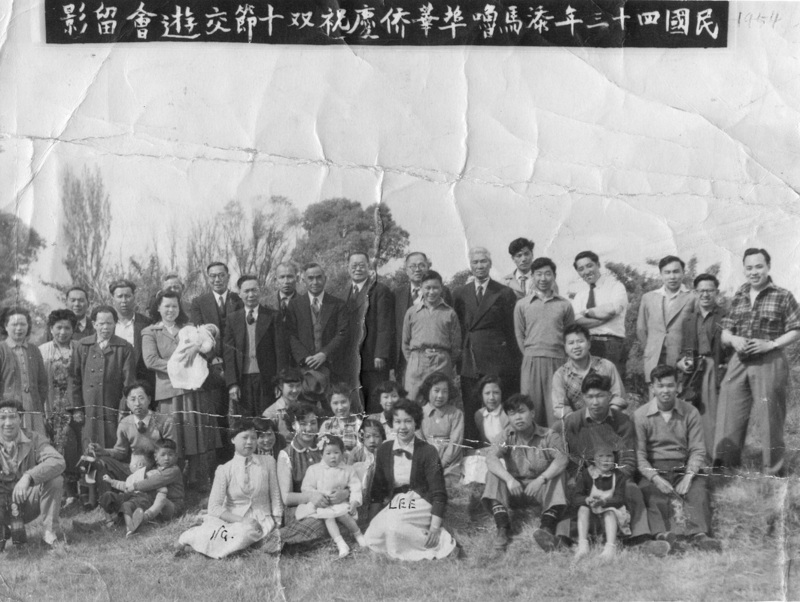 Lawyer Walton said that Yee was a visitor to the Chinese community m Timaru, from Christchurch. He had been accepted into the premises as a guest. The others m the place were not aware that he was smoking opium; he was apparently doing it quite secretly. Ah Yee admitted the offence. 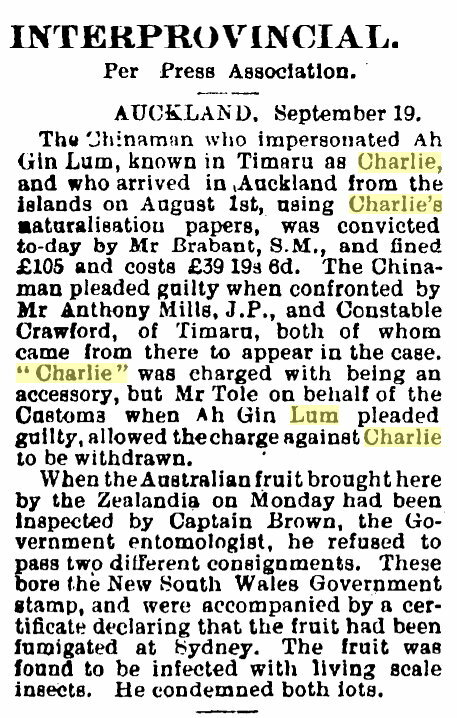 Mr. Walton informed the court i that Wah Lee went by the name of Ti Hau or Percy Chung. 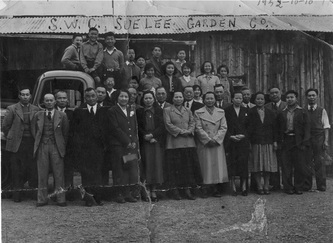 Wah Lee was the name of the Chinese community frequenting the raided premises, which had been used as a recreation house. The police had i taken this name as i that of his client. I He pleaded not I guilty to the I charge against him I on'the grounds that 1 he was not Ihe ocj cupier of the premiiimiiiiiiiimiimiiliiimiiiimiiiiimiiiiiii? ises. Lee was the member of the community deputed to look after the premises. Constable Herron gave evidence that opium fumes could be traced all through the building. A search had been made for cooking utensils but none was found. Mr. Walton: Was there any food m the premises? Herron: No, but there was a duck m the back yard. Lee was called on to go into the witness-box. Clerk of the court Reynolds: Do youunderstand English? Yee: No, I can't talk a word. The laughter at this reply put the witness wise, and a stolid silence was observed to further questions by the clerk. The services of a' Chinese interpreter were then secured. Lee's evidence- was to the effect that he was the attendant of the premises, which was a recreation house. v He denied that there had been a scuffle when the house was raided. 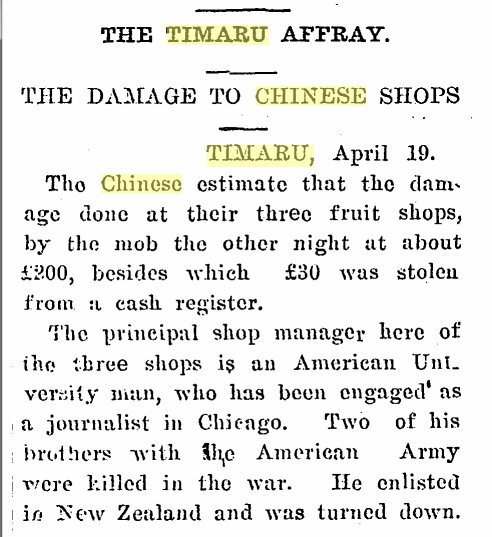 He admitted that he paid the rent for the building and that he had smelt opium fumes during the evening. Another Chinese witness said that Lee rented the shop from him. Witness understood th"at the place was being used as a cooic-shop.. Mr. Orr-Wnlker said he was convinced that Lee was the occupier of the premises and that he was aware that smoking was going on. No doubt he was acting under instructions, but this did not relieve him of liability. He would be fined £50. 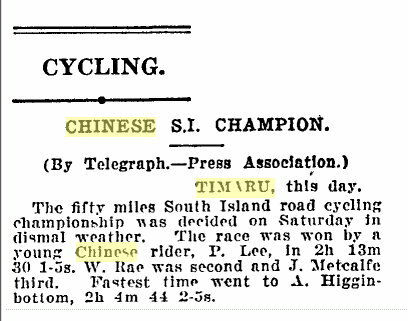 Yee was fined £20. 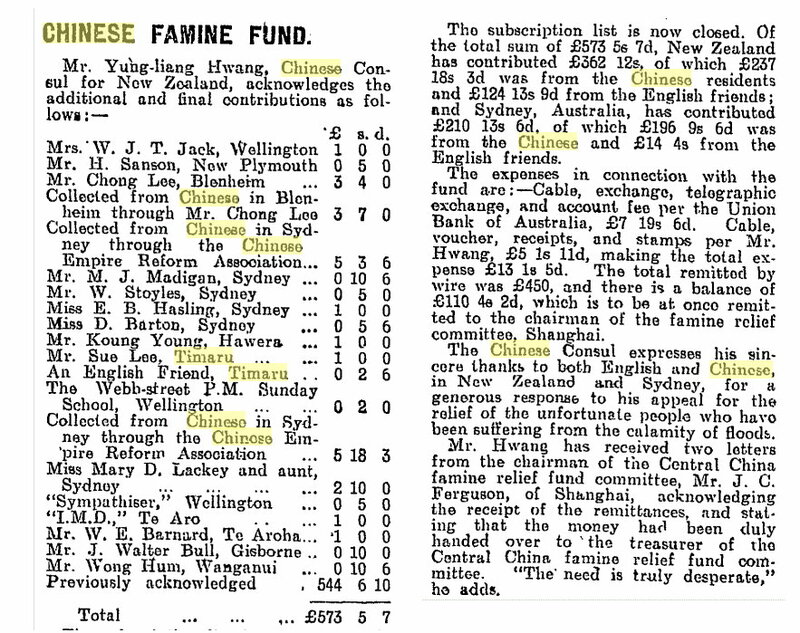 ■Neither of s>the5 >the Chinese was able to pay their fines; and accordingly distress warrants we- e issued against them, and they were ordered to remain m custody until the return of the warrants.